Members of Aberfeldy & District Gaelic Choir enjoyed success at the Dalriada Mod in Lochgilphead on Saturday 19th September. 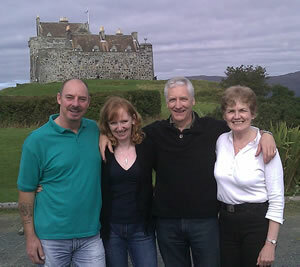 Against some stiff competition, the quartet "Fuaimeach", consisting of Gilliain MacDonald, Brian Owen, May Brown and Peter MacIntosh (pictured right), won the Quartet class for the third time in four years. Singing the lament "An Eala Bhan", they achieved marks of 92 for Gaelic and 90 for Music. The previous weekend, at the Provincial Mod held in Tobermory on the Isle of Mull, the quartet finished a close second - by just one point in Gaelic and Music respectively - to Dealrach, the ladies' four-piece who had triumphed at the National Mod last year. The roles were reversed this week at Lochgilphead, with Dealrach taking joint second place.